This is a tip from personal experience I'd like to share. Aside from having your tires regularly checked, it's also a nice habit to personally inspect your tires for any irregularities. A perfectly inflated tire (with your preferred psi) doesn't necessarily translate to a healthy and perfect tire. Two weeks ago, I was using the car for an entire week before I noticed a weird clicking noise which sped up when the car accelerates. 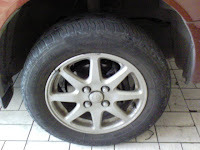 When I checked it out, there was a nail which was bent perpendicularly in such a way that half of it was pierced in the tire and the other half was bent away from the car which caused the clicking. The car's tire pressure didn't decrease despite the piercing. 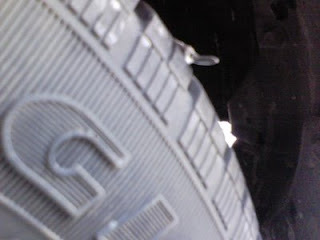 That's because the nail fit perfectly inside the tire that it also prevented any air from coming out. Good thing it caused noise which led me to closely inspect the tire. 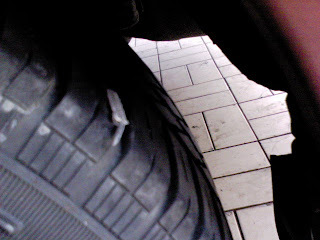 When I had the tire vulcanized, the mechanic also told me he found some small sharp rocks and a couple of nails also pierced in the tire. Some didn't penetrate the tire and were just on the top rim. I had all tires checked since I was there. The other pebbles didn't pose any harm to the tire, but it's best to regularly check them and have a healthy tire than a tire carrying unwanted foreign objects. Much thanks for the tips!